موسی پور, مریم, دبیدی روشن, ولی الله, کریمی, نیلوفر. (1396). ارزیابی پاسخ های قلبی متابولیکی به یک وهله فعالیت پیشرونده در مدیران مرد دانشگاه های منتخب کشور. 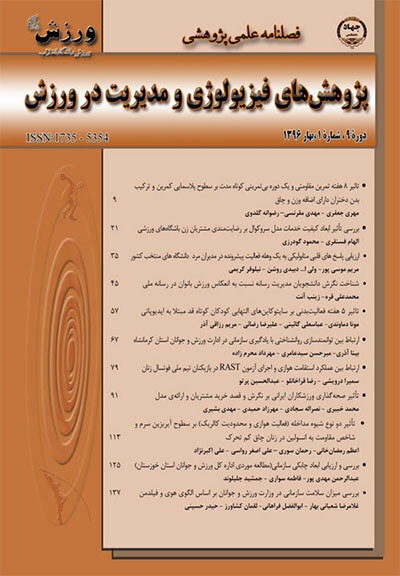 پژوهش های فیزیولوژی و مدیریت در ورزش, 9(1), 35-44. مریم موسی پور; ولی الله دبیدی روشن; نیلوفر کریمی. "ارزیابی پاسخ های قلبی متابولیکی به یک وهله فعالیت پیشرونده در مدیران مرد دانشگاه های منتخب کشور". پژوهش های فیزیولوژی و مدیریت در ورزش, 9, 1, 1396, 35-44. موسی پور, مریم, دبیدی روشن, ولی الله, کریمی, نیلوفر. (1396). 'ارزیابی پاسخ های قلبی متابولیکی به یک وهله فعالیت پیشرونده در مدیران مرد دانشگاه های منتخب کشور', پژوهش های فیزیولوژی و مدیریت در ورزش, 9(1), pp. 35-44. موسی پور, مریم, دبیدی روشن, ولی الله, کریمی, نیلوفر. ارزیابی پاسخ های قلبی متابولیکی به یک وهله فعالیت پیشرونده در مدیران مرد دانشگاه های منتخب کشور. پژوهش های فیزیولوژی و مدیریت در ورزش, 1396; 9(1): 35-44. 2Department of sport physiology, Faculty of physical education and sport sciences, University of Mazandaran, Babolsar, Iran. The aim of this study was to assess cardio-metabolic response to a bout of progressive exercise in the male managers of selected universities in Iran. In this study, 63 managers (age range 30-60 years) with at least 6 months of management were classified into 3 age groups: 30-40, 41-50 and 51-60. Modified Bruce protocol was used to perform progressive exercise on a treadmill. Blood samples were collected following a 10-hour fasting in two stages: before and after the protocol. Data were analyzed using dependent t-test, one-way ANOVA and Tukey post hoc test at significance level of 0.05. The results showed that a bout of progressive exercise significantly changed HDL-C (P values respectively 0.009, 0.001 and 0.001) and total cholesterol (P values respectively 0.001, 0.001 and 0.001) in all three groups. Changes in the LDL-C levels in the age group 41-50 (P=0.001) and adiponectin at the age of 40-30 (P=0.031) and 50-41(P=0.021) were significant. The inter-group changes were statistically significant only in cholesterol levels in 40-30 group compared with 51-60 group (P=0.038). The present study showed that a bout of progressive exercise on a treadmill had a significant effect on adiponectin levels and improved lipid profiles in male managers with different age groups in selected universities in Iran. Therefore, changes in lifestyle of these managers prevent cardiovascular diseases and increase their efficiency in working environments. حقیقی امیرحسین،یار احمدی هادی، دریجانی عبدالحامد. (1392). "تاثیر یک جلسه ورزش هوازی وامانده ساز برآدیپونکتین سرم و شاخص مقاومت به انسولین درمردان سیگاری". مجله دانشگاه علوم پزشکی سبزوار(3)20، 320-310. دبیدی روشن ولی اله، برزگرزاده حسین. (1390). "تأثیر چاقی وشدت فعالیت بر پاسخ آدیپونکتین سرم و برخی شاخص های بیوشیمیایی درزنان جوان".المپیک 54، 141-154. 3.کریمی نیلوفر، دبیدی روشن ولی ا..، رودباری فاطمه. (1392). "ارتباط لپتین و آدیپونکتین با عوامل خطرزای دیابت در زنان چاق مبتلا به سرطان پستان متعاقب تمرینات منظم هوازی و مکمل زنجبیل". پژوهش فیزیولوژی و مدیریت در ورزش (4)13، 74-61. موش های چاق یائسه".پژوهش در فیزیولوژی و مدیریت در ورزش، (2)6، 113-103. 5.Ahmadi N, Eshaghian Sh, Huizenga R, et al. (2011). " Effects of Intense Exercise and Moderate Caloric Restriction on Cardiovascular Risk Factors and Inflammation". The American Journal of Medicine,124(10); 978-982. 6.Atashak S, Piree M, Jafari F, et al (2010). "Effects of 10 Week Resistance Training and Ginger Consumption on C-reactive protein and Some Cardiovascular Risk Factors in Obese Men". Physiology and Pharmacology, 14 (3) ; 216 – 228. 7.Bateman LA ,Slentz, CA, Willis LH, et al. (2011). "Comparison of Aerobic Versus Resistance Exercise Training Effects on Metabolic Syndrome (from the Studies of a Targeted Risk Reduction Intervention Through Defined Exercise -STRRIDE-AT/RT)".Am J Cardiol,108(6) ;838-44. 8.Bouchonville M, Armamento-Villareal R, Shah K, et al. (2014). "Weight loss, exercise, or both and cardiometabolic risk factors in obese older adults: results of a randomized controlled trial".Int J Obes,38(3) ;423-31. 9.Britton KA, Massaro JM, Murabito JM, et al. (2013). "Body Fat Distribution, Incident Cardiovascular Disease, Cancer, and All-cause Mortality". J Am CollCardiol, 62(10) ;921-5. 10.Brooks N, Layne JE, Gordon PL, et al. (2006). "Strength training improves muscle quality and insulin sensitivity in Hispanic Older adults with type 2 diabetes".Int J Med Sci, 4(1) ;19-27. 11.Cao Y, Yang T, Yu S, et al. (2013). "Relationships of adiponectin with markers of systemic inflammation and insulin resistance in infants undergoing open cardiac surgery". Mediators Inflamm, 6(3) ;187940. 12.Dixon NC, Hurst TL, Talbot DCS, et al. (2013). "Effect of short-term reduced physical activity on cardiovascular risk factors in active lean and overweight middle-aged men". Metabolism Clinical and Experimental,62(3) ;361-8. 13.Hosseinpanah F, Barzin M, Erfani H, et al. (2014). "Lipid accumulation product and insulin resistance in Iranian PCOS prevalence study". ClinEndocrinol (Oxf),81(1) ;52-7. 15.Kwaśniewska M, Jegier A, Kostka T, et al . (2014). "Long-term effect of different physical activity levels on subclinical atherosclerosis in middle-aged men: a 25-year prospective study".PLoS One, 9(1) ; e85209. 16.Masahiro N, Seiko MDT, Hideo I, et al. (2011). "The ratio of adiponectin to homeostasis model assessment ofinsulin resistance is a powerful index of each component of metabolic syndrome in an aged Japanese population: Results from the KING Study". Diabetes researches earch and clinical practice, 92(3) ;e61-5. 17.Mika V, Ayhan K, Niko W, et al. (2013). "12 Weeks’ aerobic and resistance training without dietary interventiondid not influence oxidative stress but aerobic training decreasedatherogenic index in middle-aged men with impaired glucose regulation".FOOd and chemical toxicology, 61;127-35. 18.Mitchell B.M, Gutin B, Kapuku G, et al. (2002). "Left ventricular structure and function in obese adolescents : Relations to cardiovascular fitness , percent body fat , and visceral adiposity ,and effects of physical training" Pediatrics,109(5) ;E73-3. 19.Moghadasi M, Mohebbi H, Rahmani-Nia F, et al. (2013). "Effects of short-term lifestyle activity modification on adiponectin mRNA expression and plasma concentrations". Eur J Sport Sci,13(4) ;378-85. 20.Numao Sh, Katayama Y, Hayashi Y, et al. (2011). "Influence of acute aerobic exercise on adiponectin oligomer concentrations in middle-aged abdominally obese men". Metabolism Clinical and Experimental, 60;186–194. 21.Pérez CM, Ortiz AP, Fuentes-Mattei E, et al. (2013). "High Prevalence of Cardiometabolic Risk Factors in Hispanic Adolescents: Correlations with Adipocytokines and Markers of Inflammation".J Immigr Minor Health,16(5) ;865-73. 22.Racette SB, Inman CL, Clark BR, et al. (2014). "Exercise and cardiometabolic risk factors in graduate students: a longitudinal, observational study". J Am Coll Health,62(1) ;47-56. 23.Sakai S, Iizuka N, Fujiwara M, et al. (2013). "Mild obesity reduces survival and adiponectin sensitivity in endotoxemic rats". J Surg Res,185(1). 24.Santaniemi M, Ukkola O, Malo E, et al. (2014). "Metabolic syndrome in the prediction of cardiovascular events: The potential additive role of hs-CRP and adiponectin".Eur J PrevCardiol,21(10) ;1242-8. 25.Tonello D, Bueno R, Yukio J, et al. (2013). " Aerobic training and lipid profile of hypothyroid rats". RevistaAndaluza de Medicina del Deporte, 6(2) ;47-5.